I’ve previously discussed on this blog why you might want to add short rows to raise the back neck of a yoke sweater. If you’re sold on the idea, you might be wondering, how do I do that? Today I’ll explain how to add short-row neck shaping to a bottom-up yoke sweater that doesn’t already have it written into the pattern. 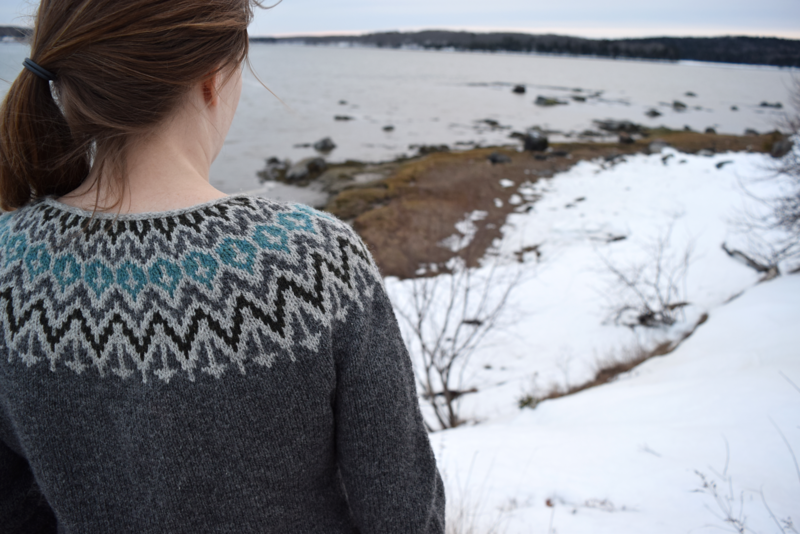 Some sweater knitting patterns will include the short rows here, such as Jennifer Steingass’s Sigrun sweater (below). But many colorwork sweater patterns don’t include the short rows, and the sweaters will still fit just fine without them. But if you would like to add short rows to your pattern, the easiest place to add short rows is before the colorwork patterning on the yoke, shortly after joining your body and sleeves. The reason I find this this easiest is that when you haven’t worked any decrease rows yet, your sleeve and body stitches are still clearly delineated. To make it really simple, you can place markers for each section (4 markers total—one before the sleeve, one before the front of the body, one before the other sleeve, and one before the back body). Typically, you would start the round with the stitches from the left sleeve. Knit across the left sleeve stitches, and then knit about a third of the stitches from the front, making a note of how many of the front stitches you worked. Wrap and turn, then purl all the way around the left front, left sleeve, the back, the right sleeve, and then the same number of stitches into the right front as you worked on the left. Wrap and turn. Knit to three stitches before the first wrapped stitch, wrap and turn. Then purl to three stitches before the wrapped stitch on the other side, wrap and turn. Repeat these last two rows twice more, always working three fewer stitches on each side. Now you’re ready to start working complete rounds again. Your back will be eight rows longer than your front. If you’d prefer to work your short rows at the top of the yoke, just before the neckband, you can use the same method, but first you’ll have to figure out how many of your remaining stitches belong to each sleeve section, the front, and the back. You can do this using ratios. For an example, let’s look at the numbers for the largest women’s size of Afmæli, a popular free Lopi pattern. At the point where you join the body and sleeves you have 56 stitches for each sleeve, and 88 stitches each for front and back, which adds up to 288 stitches total. To calculate the ratios for the individual sections, you want to divide the (smaller) number of stitches for each section by the total number of stitches in the yoke. So, in our example, 56 sleeve stitches divided by 288 total stitches is .194 (19.4%), and 88 front or back stitches divided by 288 total stitches is .306 (30.6%). When you finish all your yoke shaping, you have 108 sts left. Multiply 108 times the sleeve ratio of .194, and you have approximately 21 stitches for each sleeve section. That means you have 33 stitches each for back and front. So, to start your short rows, you’d first knit across 21 sts for the sleeve section, then about a third of the 33 front stitches (11 sts), then wrap and turn. Purl those 11 sts, the 21 sleeve section stitches, the 33 back section stitches, the 21 right sleeve section, and then 11 more on the front section. Wrap and turn. Complete your short rows as I described above, and then proceed to the neckband. Whew! You’re done. Talk about coincidence. I just finished knitting the pictured sweater in the opening caption and was wondering about how would I improve the neck line fit. I’ll know better next time because I’m not unraveling a completed and set sweater. But thank you for satisfying my curiosity. This is exactly the info I was looking for! I am about to start the yolk on this exact sweater and have never done short rows. Reblogged this on Agnes og Musen.